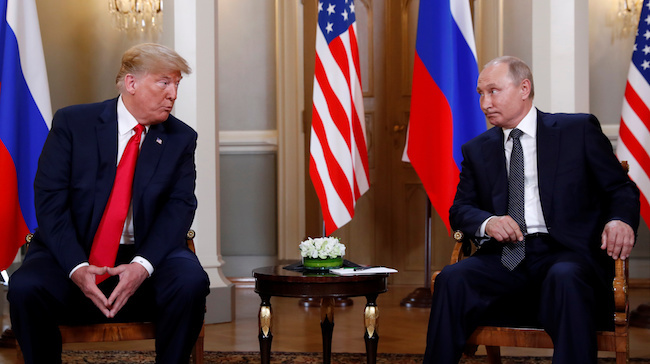 President Donald Trump met Russian President Vladimir Putin Monday in Helsinki, Finland, as tensions between the U.S. and Russia rise. The important meeting between the two world leaders comes amid new indictments of Russian officials in special counsel Robert Mueller’s investigation and worsening ties between Washington and Moscow. The initial meeting was cordial but tense. “We have a lot of good things to talk about and things to talk about. We have discussions on everything from trade to military to missiles to nuclear,” Trump said during a joint press conference with his Russian counterpart shortly after their initial greeting. The president, as his critics were quick to note, did not mention election meddling in his list of topics for discussion, but this issue may be brought up at a later point in the summit, as Trump has said as much. He stressed during the press conference the need for improved relations with Russia. “Getting along with Russia is a good thing,” he explained. His comments follow a historically inaccurate tweet that suggests that deteriorating U.S.-Russian relations are tied to the ongoing Russia investigation, what the president calls a “witch hunt.” The investigation has yet to produce any solid evidence that Russia influenced the outcome of the presidential election or that the president colluded with Russia to win the 2016 election. Secretary of State Mike Pompeo will sit down with Russian Foreign Minister Sergey Lavrov while Trump and Putin meet in private and expanded sessions with advisers.